Beneteau Swift Trawler 34 has been a success and the reason behind it, its great performance, enhanced look and comfortable living space. The good looks of the exterior are compatible with the warm, inviting interior. Mahogany woodwork and parquet laminate sole makes the cabins bright and cheerful. 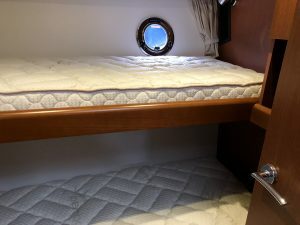 The forward master stateroom features an island double berth with storage. The guest cabin at the port with bunks can be great for kids or guests. 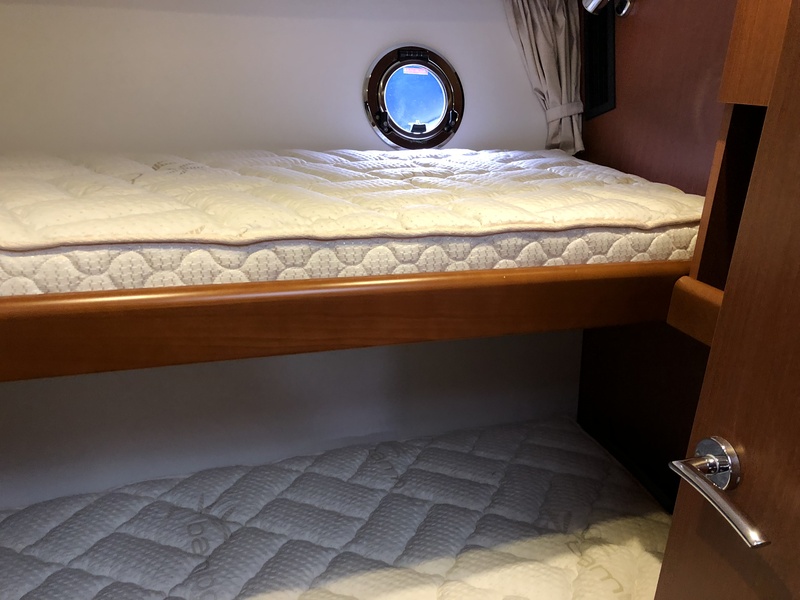 We did new mattresses for the forward and bunks. We specialize in latex. Latex is very supportive because it is a high-pressure material. Also, it is mold and mildew resistant, extremely comfortable, helps regulate body heat, which allows you to sleep cooler and it is bendable and breathable. It is very flexible that makes it super easy to make the bed and get fitted sheets on. 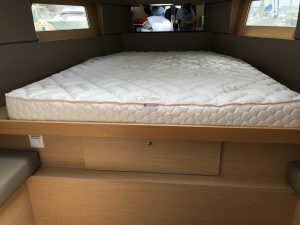 You can see in the image here how the Forward mattress has a hinge up the middle. 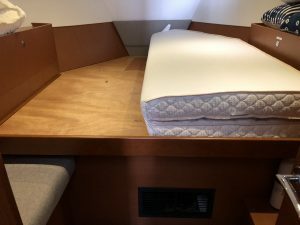 Hinging is a great option when you have storage underneath the mattress or if you need to be able to fold it in half for easy removal from the platform all together. You won’t feel the hinge because the quilted cover pulls the two pieces together to create a smooth surface. We can hinge your mattresses at no additional cost so don’t forget to ask if you need one. You definitely don’t want to miss on our 600 thread count Egyptian Cotton sheets to go with your new mattresses. They are a must. We provided white sheets for this client and then used our white Interlaken Matelassé blankets to give the finishing touch to all the beds. Everyday cotton and rich texture of these Interlaken blankets strikes a beautiful balance between modern chic and effortlessly casual for a well-dressed bed. Visit our website to check out the various colors available. Most of our clients also love our Diamond Matelassé coverlets. Lightweight, easy-care cotton makes this a staple for all staterooms! This classic coverlet features a diamond pattern texture, and its cotton construction provides maximum comfort, beautifully made to fit your custom boat mattress. I always like to remind that we make everything custom to fit your specific boat and have wide range of fabrics, patterns and colors to choose from. All you need is to let us help you transform your stateroom into a Statement Room.